Solitary Man, of his own design. 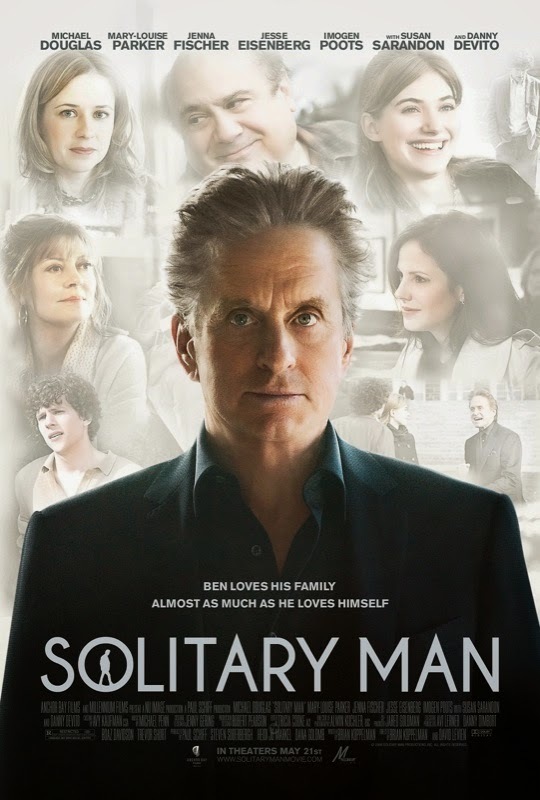 Michael Douglass’ character Ben Kalman wears all black and is introduced to us with to Johnny Cash’s cover of Neil Diamond’s “Solitary Man” playing in the background. Ben is kind of like Johnny Cash… if Cash had no sense of personal responsibility or dignity or morality. That is to say, Ben is nothing like Johnny Cash. But he wants to be Johnny Cash, or at least to have that ethos. He wants to be seen as a man fighting the system that keeps him down. Only Ben can never be Johnny Cash because, unlike Cash, all of his problems are self created and he refuses to take any blame for his misfortune and does nothing to fix them other than blame others. Let’s go back to the beginning though… Ben Kalman gets the news that “something is wrong” from a doctor. Instead of going to get it fixed at the hospital Ben decides to live life in the fastlane until whatever disease he has finally does him in. The only problem with this is, six years later, this unknown disease still hasn’t gotten him, and he has destroyed every aspect of his life in search of a good time. Once prominent car salesmen, self-created legal woes have crumbled his car empire. On the personal front, he divorced his wife to try to hook up with every 20-something woman he comes across, no matter who they are and what relationship they have. This movie was an interesting exercise to say the least, an exercise in creating a fully unlikeable character. I suppose this film fits into the genre of “Old Guy with One Last Shot at Redemption” (along with Crazy Heart, The Wrestler and most of Clint Eastwood’s late period). However, this character is unlike any of the others in this subgenre – Ben makes no attempt to fix his problems by taking proactive steps, and only blames others for everything that has gone wrong. He goes after college girls and tries to party with college guys. It isn’t him who is shamelessly trying to reclaim youth, no it’s his wife’s fault for not being good enough, or so he insinuates. Instead of trying to finalize the loose ends and enjoy his final chapters of life, he wants to be young and cool – a rebel without a cause. And succeeds only at destroying what life he has left. Needless to say, as I have been talking about Micheal Douglass’s character this whole review, this film is his showcase, his post-downfall. But the supporting cast that Ben uses and abuses also shines and, I have always felt that no character study could stand up without good supporting base. The women who actually care about Ben, his wife and daughter, are played by Susan Saradon (The Lovely Bones) and Jenna Fischer (The Office) respectively. We know they love him and want him to come back to them, though their pleas mostly fall on deaf ears. Then there is the criminally underutilized Danny DeVito as Ben’s old friend Jimmy, who Ben inposes upon primarily out of self-interest all the while scoffing at Jimmy’s hospitality. Jessie Eisenberg also stars as one of the college kids. Do I recommend this film? Yes, I suppose so. The film is well made, there is no doubt about that. The acting and the screenplay are top tier. Will you enjoy it? Hard to say, this isn’t really a film you enjoy in the traditional sense. Ben is a lowlife with nearly no redeeming qualities, making it a difficult viewing. For this audacity, however, the film should be applauded among cinema lovers. Worth checking for cineastes looking for a smaller drama during the summer blockbuster season. Written by Brian Koppelman and directed by Koppelman himself with David Levien.